The Vale of Rheidol (Cwm Rheidol) is well known by industrial archaeologists for its historic lead and silver mine workings and levels, but over the course of a century, nature has reclaimed the landscape. 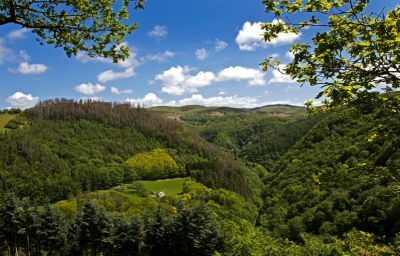 Now this hinterland of Aberystwyth feels truly unspoilt and undiscovered, and it's ideal for the walker with its delightful network of old miners’ paths and tracks amid truly stunning and varied scenery. The valley contains significant fragments of the ancient sessile oak and birch forests that would have originally covered much of upland Britain. It is home to a wide variety of wildlife, including a huge abundance of red kites and buzzards, as well as ravens, kingfishers, and now, it seems, the elusive pine marten. The small ‘dead-end’ valley road is inadequate for carrying much in the way of motorised traffic, and long may it remain so! Winding upwards from Aberystwyth to Devil’s Bridge, clinging to south side of the valley, is the 115-year old narrow gauge steam railway, with intermediate stations serving the many walks set out in 'Railway Walks in the Vale of Rheidol’ (available from the Aberystwyth tourist office and the railway shop at £4.99). 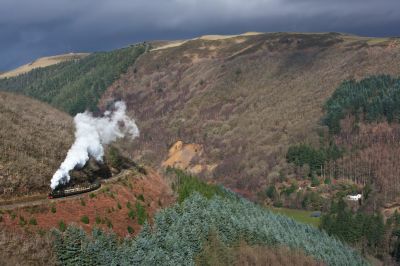 Nantyronen Halt and Aberffrwd station are served by steep and narrow lanes, while Rhiwfron and Rheidol Falls Halts have no vehicular access at all. Car-free walking indeed! 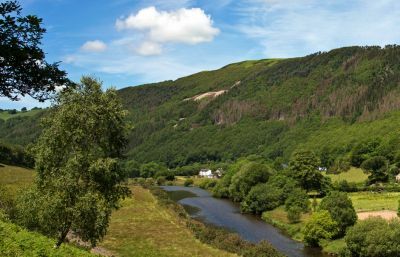 Its proximity to the national parks of Snowdonia and the Brecon Beacons means this fabulous walking area still remains unrecognised, relatively unpromoted – and, unfortunately, unprotected. The paths are often narrow and steep, but well waymarked, and it is rare to encounter any other walker during a day following one of the routes in the a guidebook. Nearby, the Ceredigion Coastal Path is rightly gaining popularity, but many enthusiastic walkers still unaware of the alternative delights just round the corner from this. Even a doubling of the number of walkers in the Vale of Rheidol would hardly be noticed, and the railway provides the perfect means of transport. The terminus at Aberystwyth station also feeds in to Arriva Trains Wales services from Shrewsbury and Birmingham. 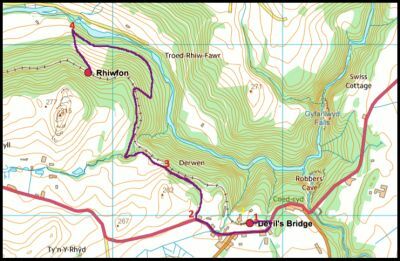 All six stations along the line, from Capel Bangor to Devil’s Bridge, have interesting walks of varying lengths and difficulty, and of course with the benefit of the 'all-day rover’ tickets on the train, linear routes between stations are possible. Viewers of the Welsh TV crime series Hinterland (Y Gwyll), which is set in this area, may be keen to start their explorations from the Devil’s Bridge rail terminus, with the atmospheric Hafod Hotel a short walk down the road. The steep circular visit to the Mynach Falls is a dramatic introduction, accessed via a turnstile just over the famous and eponymous Three Bridges next to the hotel. This is also just about possible (at a good pace) during the 75-minute turn-around time of the train, but it would be a pity to rush and miss out on the other delights that Devil’s Bridge has to offer. Words by Maurice Kyle, author of ‘Railway Walks in the Vale of Rheidol’. Photos by John R. Jones.